THE MAGIC OF DUCKS and wetlands hooked me the first time I set eyes on a marsh. It was 1977. After waiting patiently to reach the magic age of 14, it was time to pull on my boots, shoulder a gun and participate in my first duck hunt. Opening day was wet and windy that year — perfect weather for duck hunting. My dad was to my left, hunkered down in the cattails, looking into the rain and the wind, dropping duck after duck with his Ithaca 12 gauge. Within an hour, he had his 7-duck limit. 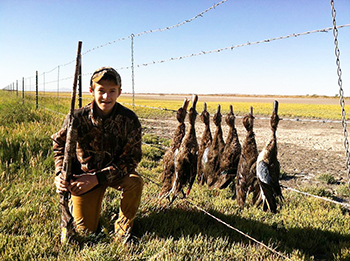 14-year-old David Hadley with the ducks he took on the 2013 Youth Waterfowl Hunting Day. I, meanwhile, popped away at the birds with my little single shot Savage. Miss after miss followed. “Man,” I said to myself, “these ducks are hard to hit!” Finally, a big drake mallard flew straight at me. I shot, and it fell. What a thrill! For one, David didn’t have to wait until he was 14 to hunt. If a young person can complete the state’s Hunter Education course, he or she can small game hunt, regardless of age. Eliminating the minimum age at which someone can hunt small game has provided David and me with years of memories we wouldn’t have had otherwise. I started taking him into the marsh when he was 8. He started hunting — with the same single shot shotgun I started with — at age 10. 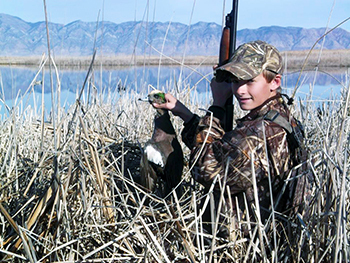 At about the same time the minimum age was eliminated, Utah started holding a Youth Waterfowl Hunting Day. Only those 15 years of age and younger can hunt waterfowl in Utah that day. That means the marshes, and all of the ducks and geese that go with them, are available only to kids that day. Those aren’t the only things I realize are different, though. David’s not using the little single shot shotgun anymore; he’s already graduated to the Ithaca 12 gauge I used in high school. He accurately identifies ducks in the air and calls to them better at 14 than I can at 50. And he has a confidence about him that took me years to develop. David Hadley with his first drake wigeon. As David wades out to retrieve another duck, it occurs to me that at the young age of 14, my son is already a duck hunter. My mind fills with memories of the days my dad spent with me in the marsh. How thankful I am that he introduced me to something that’s enriched my life more than words can say. As David wades back, a beautiful bird in his hand and a smile on his face, I know that legacy will continue. I know ducks, geese and the marshes they live in will enrich his life as much as they’ve enriched mine.